Technology, especially cloud computing technology, provides huge opportunities for real estate organizations and should become a priority. 80% of the top real estate performers are using some form of cloud. Their use of the cloud can certainly improve though, while other organizations can follow their lead and realize the benefits of the technology. Real estate is a relationship-driven sector, hence the emphasis on marketing, sales, client service, and collaboration. And when you think about it, real estate is a mobile business. After all, the majority of real estate business activities occur outside of a traditional office space. Already, these characteristics make the sector a perfect fit for cloud computing solutions. Today, real estate organizations rely on email, file sharing, data storage, Web hosting and mobile applications. 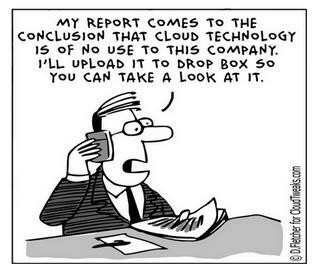 These actions are best performed in the cloud. There are countless lead and marketing management cloud solutions that can be extremely valuable for the real estate sector. These solutions help real estate professionals capture leads, as well as track the success of marketing efforts and automate communications. Email marketing is one of the most popular cloud services for real estate. There are many third-party cloud email services available, including MailChimp and Constant Contact, that are not only cost effective and easy to use, but also customizable, insightful and reliable. Perhaps one of the most beneficial features is real-time insights. It’s easier than ever to gain statistics about who’s opening emails, when they’re opening them and what links people are clicking on. These statistics deliver leads to a business, making it easier for the team to go out and gain new clients. This really helps connect the marketing and sales teams, enhancing collaboration. Additionally, effective communication now comes in other forms. Marketing communication use to include direct mail, magazines, face-to-face communication, cold calling and other outdated methods. Now, effective communication is taking place over email, apps, websites and connected devices. By taking advantage of these solutions in the cloud, real estate companies can more quickly respond to inquiries while boosting their credibility. Additionally, professionals will work more effectively and provide better service when they are connecting with clients on modern platforms. With cloud computing, real estate organizations can essentially move the office online, allowing professionals to be productive – always! They can work from any location, using any device – this really makes life simple. When real estate agents use the cloud, they can access a fully synced address book and calendar, as well as easily stay in contact with the office, clients and other business contacts. If they’re with a client at a property, it’s easy to pull up necessary property information or show comparable options using virtual tours or street-view maps, right from a smartphone or tablet. This doesn’t only simplify processes. It’s also impressive from a client standpoint, and allows an agent to close deals more frequently and quickly. Customer Relationship Management is also commonly known as CRM. This type of cloud platform allows a real estate organization to both access and capture information about potential and current clients. It also allows for interactions between the company and its customers. A CRM system manages growing connections in a growing business. The CRM provides valuable insights around the actions and progress of a company’s workforce. Additionally, it allows the company’s sales team to access and input potential and current client information on the go, easily and quickly. Agents can track properties, leads, referrals, sales, lease expirations and more with a cloud CRM service. Companies can even integrate existing software into the CRM platform, like marketing or storage software, making it easier to compile contact lists or find files all in one spot. As for building connections, a CRM helps a real estate team collaborate with customers, makes documentation and information available to clients, and gathers valuable insights that help improve business. Though it’s not necessarily the first industry that comes to mind when talking about data security, real estate professionals definitely manage sensitive information including drivers license numbers, credit scores, social security numbers and more. Cloud computing helps the companies achieve higher levels of security and adhere to guidelines found in other strict industries, like financial. The cloud also helps real estate companies save a substantial amount of money, as the cloud provider handles the costs of infrastructure, upgrades, cooling, power, software licenses, etc. Scalability is one of the most popular features of the cloud, allowing companies to use resources as needed. This helps real estate companies deal with temporary swells in numbers. For example, if payments consistently come in at a certain time of month, the company can increase power for that period and then reduce again as things stabilize.